brandflakesforbreakfast: ceiling poster - ingenious or intrusive? 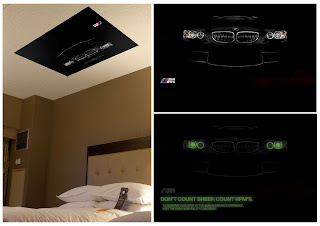 ceiling poster - ingenious or intrusive? Hotels are known for what is revealed with a black light on comforters, headboards, carpets and more. Now, the ceiling has been soiled. This ad, placed above hotel beds to encourage people to visit the concierge for a BMW driving experience by revealing a glow-in-the-dark message, get its point across and is a semi-clever execution, but seems a bit intrusive. Please don't let this catch on.